Easy to grow, long lived spreading perennial that blooms for an incredibly long three months in spring. 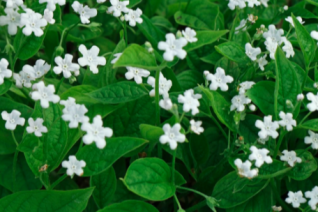 Fresh white forget-me-not flowers appear in clouds on wiry stems. The solid corrugated green foliage is an ideal foil. Creeping to several feet across in rich to average well drained soil with regular summer moisture. Thrives in part shade and finds a perfect home under large shrubs, at the base of trees. Fresh and white. To 8″ tall. 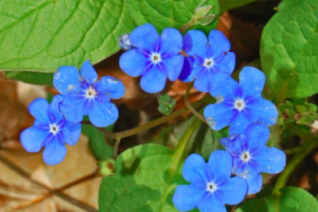 The blue stars of this borage relative are unmistakenly breathtaking in spring. This European relative of forget me nots (Myosotis) forms spreading clumps which give rise to clouds of sky blue flowers from March to June. 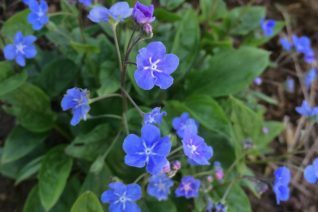 To 6″ tall and 15″ wide in rich, well drained soil with regular summer water. Very pretty with early blooming Epimediums and the pale primrose yellow flowers of Primula vulgaris. Nice looking corrugated foliage. Part shade. Regular summer water. Resistant to slugs/snails.